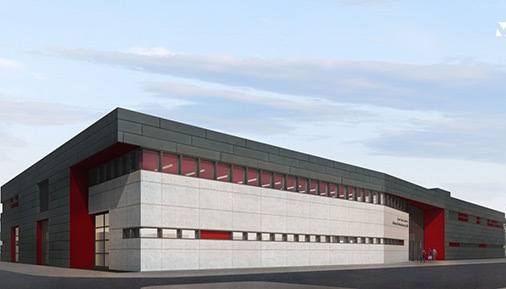 What: Hudson Valley Community College will host a groundbreaking ceremony for its new $14.5 million, 37,000-square-foot Gene F. Haas Center for Advanced Manufacturing Skills (CAMS). Who: Dr. Andrew J. Matonak, President; the College Board of Trustees; the Board of Directors of the college Foundation; elected officials, manufacturing industry leaders; students, alumni, faculty and staff. Shovel ceremony and tours of Lang Hall Advanced Manufacturing Technology Lab: noon to 12:30 p.m. Parking is available in Lot D.
Details: The Gene F. Haas Center for Advanced Manufacturing Skills (CAMS) will allow the college to double enrollment in the Advanced Manufacturing Technology (A.O.S.) degree program from 144 to 288 students and meet an urgent workforce demand for skilled manufacturing employees in the region. CAMS is envisioned as a one-stop manufacturing technology center that will train students on the latest machine tools, equipment and software. The building's design provides corporate partners with access to offices and conference space adjacent to faculty offices, student classrooms and labs. Facilities will be available for corporate demonstration purposes, shared training activities, meetings and events that connect the college to its workforce partners more than ever before. The college's Advanced Manufacturing Technology degree prepares graduates for careers as CNC machinists/programmers, tool makers and industrial maintenance technicians along with technical marketing, sales, procurement and manufacturing supervisory/control jobs. It is the only community college training program of its kind within 125 miles. It has a 100 percent job placement rate for graduates, with nearly all students securing work prior to of graduation. Construction on CAMS is expected to be complete in fall 2019.